The old saying goes: it never rains, but it pours, and as far as the Rogue.VirusDoctor cluster of malicious computer applications is concerned it certainly is true. The reason that allows us to say so is Windows Personal Detective - the newest addition to the family even though just yesterday we have updated on other previous clones from this group: Windows Malware Sleuth, Windows Trojans Sleuth, Windows Trojans Inspector and the others. 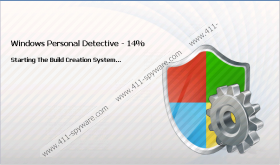 True to its nature Windows Personal Detective fits very well into the your operating system's interface, making it seem as it the rogue is a legitimate part of Windows, designed to keep your system safe. Unfortunately, Windows Personal Detective is a dangerous rogue antispyware created to exploit unsuspecting computer users such as yourself, and it will stop at nothing until it reaches its goal, that is MONEY. Once it is "registered" Windows Personal Detective will cease sending fake security notifications and you will have your programs back for the time being. You have to use this moment to remove Windows Personal Detective completely, because even though the rogue is silent, it is still there. If you do not trust your computing skills to perform the manual rogue removal on your own, you are recommended to acquire a trustworthy antimalware program that will efficiently terminate Windows Personal Detective and you will no longer have to worry about your system's security.